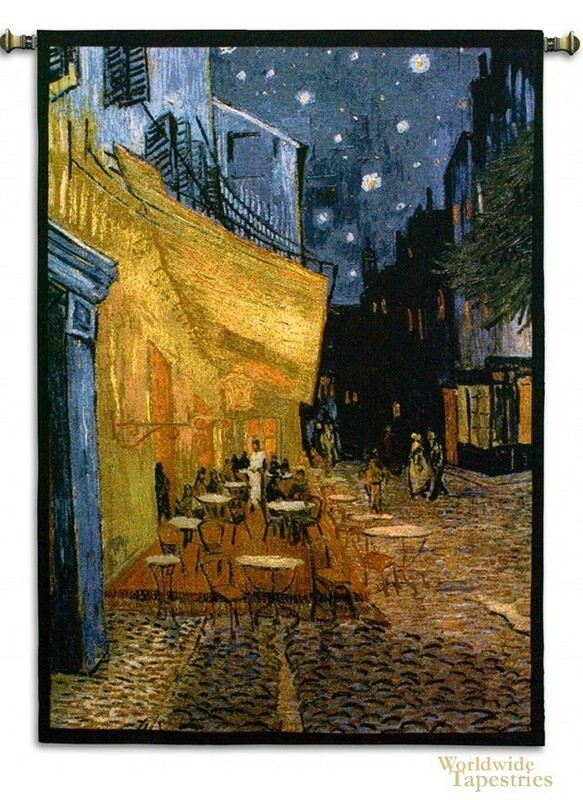 The famous painting by Vincent van Gogh of Cafe Terrace at Night is the subject of this fine art tapestry. Van Gogh completed this famous work in mid September 1888, which is also known as "The Cafe Terrace on the Place du Forum". Van Gogh enjoyed sitting and painting in this cafe, and visitors today are able to sit on his particular spot in the establishment, in the north eastern corner of this popular coffee house. He would look out towards the lit street scene of the Rue du Palais leading to the dark buildings in the background including a church tower. The appearance of the starry night was his first rendition of this style of rendition of the night sky, later of course followed by his famous Starry Night. This art tapestry is backed with a lining and a tunnel for easy hanging. Note: tapestry rod and tassels, where pictured, are not included in the price.